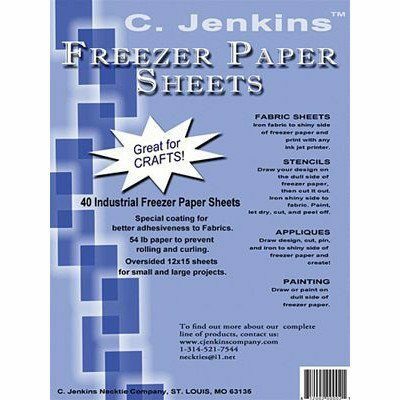 40pk Freezer Paper Sheets 12"x15"
Print directly on your fabric with C. Jenkins freezer paper sheets. The industrial XLL freezer paper provides a layer of sturdiness to your fabric allowing you to run it through an inkjet printer. The special coating creates a superior adhesion, allowing the paper to stick to fabrics with low heat from an iron. These sheets are over twice the weight of standard freezer paper. This thickness prevents rolling and curving while printing. After printing, simply peel the freezer paper off. This 40 pack of freezer paper sheets can be used to make fabric sheets, stencils, appliques, printing, and painting. Customer Reviews for the 40pk Freezer Paper Sheets 12"x15"